^ World's biggest spider face-off - see which bug wins here. [2019-02-27]. （原始内容存档于2014-10-23）. 互联网档案馆的存檔，存档日期2014-10-23. ^ Herzig, Volker; King, Glenn F. The Neurotoxic Mode of Action of Venoms from the Spider Family Theraphosidae. (编) Nentwig, Wolfgang. Spider Ecophysiology. Springer. 2013: 203. ISBN 978-3-642-33989-9. 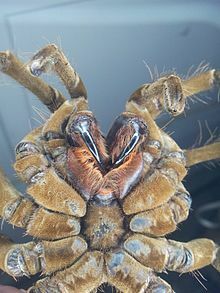 ^ Goliath Bird-Eater Spider. Spiders Worlds. [2018-11-11]. （原始内容存档于2018-10-11）. 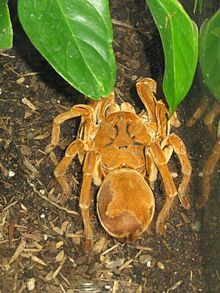 ^ Goliath Bird Eating Spider. Blue Planet Biomes. 2003 [2018-11-11]. （原始内容存档于2018-07-19）. ^ Striffler, Boris F. Life history of Goliath Birdeaters – Theraphosa apophysis and Theraphosa blondi (Araneae, Theraphosidae, Theraphosinae) (PDF). Journal of the British Tarantula Society. November 2005, 21 (1): 26–33 [2013-09-10]. ISSN 0962-449X. （原始内容 (PDF)存档于2013-12-06）. 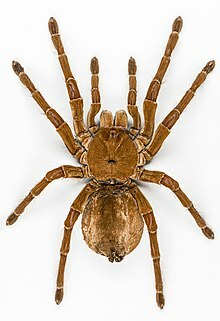 ^ Perez-Miles, Fernando; Montes de Oca, Laura; Postiglioni, Rodrigo; Costa, Fernando G. The stridulatory setae of Acanthoscurria suina (Araneae, Theraphosidae) and their possible role in sexual communication: an experimental approach (PDF). Iheringia, Série Zoologia. December 2005, 95 (4): 365–371 [2019-02-27]. doi:10.1590/S0073-47212005000400004. （原始内容存档 (PDF)于2017-08-22）. ^ Lewis, Tanya. Goliath Birdeater: Images of a Colossal Spider. Live Science. 2016-10-18 [2017-02-20]. （原始内容存档于2019-02-20）. ^ Lewis, Tanya. Goliath Encounter: Puppy-Sized Spider Surprises Scientist in Rainforest. Live Science. 2014-10-17. （原始内容存档于2017-11-24）. ^ Menin, Marcelo; Rodrigues, Domingos De Jesus; de Azevedo, Clarissa Salette. Predation on amphibians by spiders (Arachnida, Araneae) in the Neotropical region. Phyllomedusa. October 2005, 4 (1): 39–47 [2019-02-27]. ISSN 1519-1397. doi:10.11606/issn.2316-9079.v4i1p39-47. （原始内容存档于2018-12-15）.